Small craft business accounting and tax returns! Note: this is a 2013 post. Cash basis is currently allowed if you want to use it (but accruals suits me better – it means in years that you sell more, you claim back more of your material costs, reducing your bill). I’m going to point to Lois Designs UK Tax for Small Crafting Business Series. These are a really useful series of posts! The big unintuitive thing, and one I really wasn’t expecting, despite having done some reading before December on tax returns, was the difference between cash basis and accruals basis accounting. Cash basis is what you probably think of first: you take this much money, you spend that much on stock, you can claim this much on the stock you’ve bought. But HMRC doesn’t allow *anyone* to use cash basis accounting. (If you are and you’re tiny, you might get away with it if they never audit you. I do not think it’s worth the risk). So, in accruals basis accounting, you record things when a transaction takes place, not when you spend the money. The usual example given is magazine subscriptions – you can pay a lump sum in advance, but when accounting for it, if it goes over different tax years, you need to split it up based on how much of your subscription you’ve received in each year. The big change is to do with stock. You should only be claiming for stock you’ve bought when you have sold an item made with it. That is a HUGE difference. Got beads you bought years ago and used half of them in a necklace last year that sold this year? You can now claim for half of them. This means you have to keep track of what materials you used in what item, and when you sell it so you know what you can claim for and when. This is Lois’ post on stock, which lays it all out very well: TSCB 6: Expenses – Stock, Work in Progress & Appropriations. 1. Do a full stocktake the minute you become self-employed. Then you know exactly what you’re starting with. 2. When you make something, write down what was in it. (Time taken is also handy for pricing, not for the tax return). I’m not too bad on this one – I keep a record of what I do in each beadmaking session, with recipes, so I do know when I made each bead and what was in it. I also have a notebook with jewellery designs where I note what I’ve used (and the time when I remember…). I think what would help is weighing seedbeads before and after use in a piece. That way I know exactly how much of them I used. Larger beads are easier to keep track of! 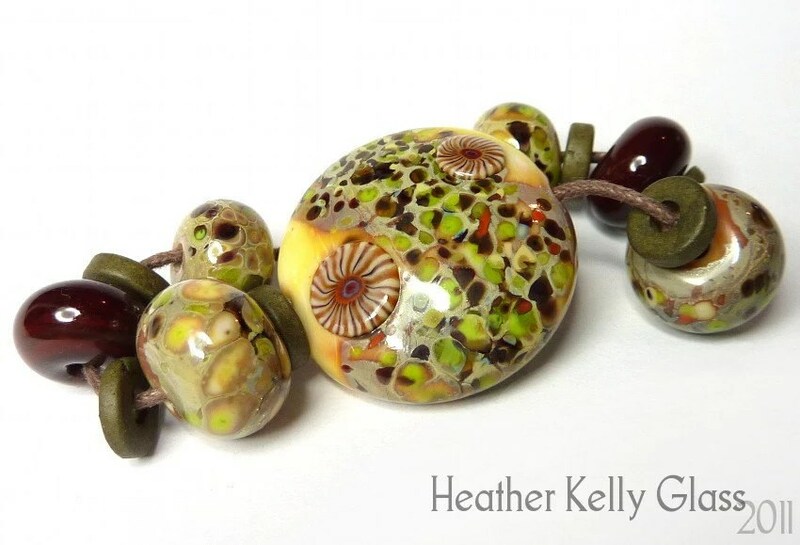 How much of each colour of glass was used in a lampwork bead is trickier, but there are reasonable and consistent estimates I can make. 3. The usual, keep my accounts up to date as I go along. That’s not nearly as big a deal as the stock issues, though. I’ve finished cataloguing all my bought jewellery supplies. I am almost finished doing my personal lampwork glass rod collection (there’s always another jar :p) and I have the Lauscha to do. The Lauscha’s simpler because I know how much I bought and how much I sold. There’s some I used myself for my test beads which aren’t for sale, there’s some I used in beads which are for sale, there’s some I gave away (advertising!) and there are the single rods I sold which I have average weights for, so aren’t a problem. In terms of lampwork rods, I’ve weighed all the bundles in my glass storage so I know how much I have unused of each colour. In terms of the jars on my desk, I’m splitting them into unused, longs (more than half a rod) and shorts. Unused gets an average price for a bundle of mixed rods. Longs get a reduced value, because they would still be sellable at a discount. Shorts I am considering unsellable (I mean, you maybe could, but we normally give them away to newbies or just for the price of postage). Silver glass shorts are an exception and get a further reduced value. I began in time and have enough time to finish. It really does take a while if you’re not up-to-date, though! I’m going to be counting and weighing things for the rest of the evenings this week. If you didn’t see, I added other blogging people doing this challenge to my previous post. They’re in at the bottom here too, and here is the Craft Pimp week 2 thread with other non-blogging entrants. 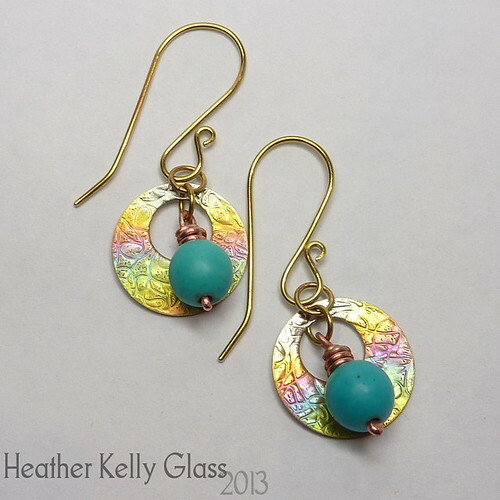 Art Jewelry Elements are also doing an earring challenge, split into 13 week segments. I’m not joining in to begin with because it requires artisan beads or components in every pair, and I don’t want to restrict myself from using anything in my stash that I feel like, right now. 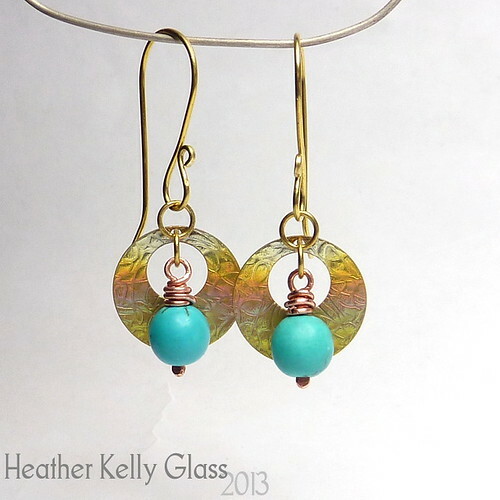 I may join a later quarter and do all lampwork earrings for that time. So, week 2! What I am finding is that doing this challenge shortcuts a lot of the agonising over finding the ‘perfect’ beads and design to go with the main element I’ve chosen, because that’s what makes jewellery take a long time for me. (I also don’t do it too often, so nearly every item involves designing from scratch rather than putting different colours into a design I’ve developed already – that’s not very time efficient!). Instead of looking through all the beads I own to find the best combination, I can say “I am using these discs, and I will pick something good enough to go with them”. I can make a different combination another time. These beads use leftover pink lampwork discs I made for a commission necklace, along with purple dyed semi-precious stones* and sterling silver saucer beads and findings. (F’rex, http://www.beadshopuk.com seems pretty good. Dyed beads are split out from non-dyed, regions are mentioned, the turquoise is split into stabilised and reconstituted, and it is explained what those mean. It tells you that the New Jade is bowenite, a form of serpentine). In terms of jade, that *is* partly a cultural issue – in China, jade did refer to all those types of greenish stone, and the traditional jade carvings frequently were made from serpentine. When it comes to other semi-precious mis-namings, that’s not usually the case. And when you’re selling over here, you ought to be sure of the difference.